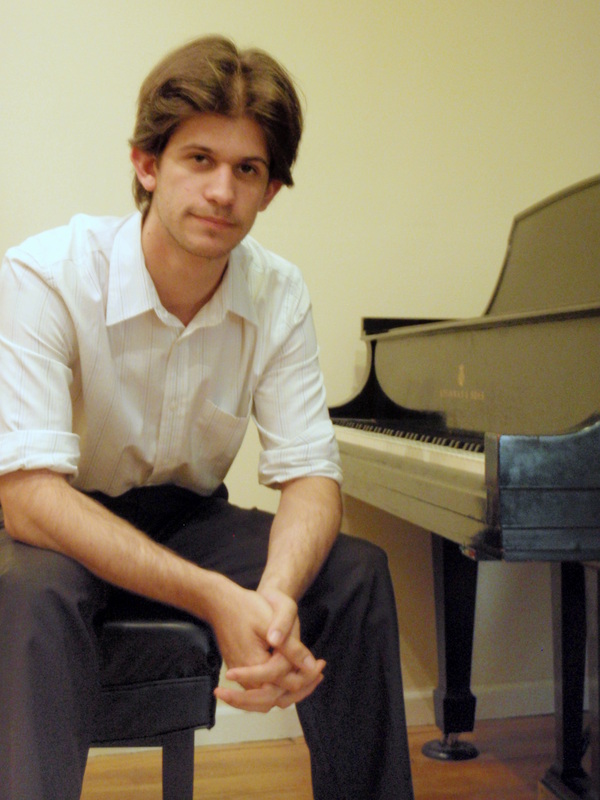 John Kamfonas is a young pianist (early twenties–to me, that’s young; he’s about my son’s age). He’s playing tomorrow (Wednesday) night on the Greencastle Summer Music Festival, a series of 12 Wednesday-evening concerts I organize (or as the say in NY, “curate”). To me, John’s a great example of a next-generation musician. He’s a terrific classical pianist, who just received his Master of Music from the Manhattan School of Music (MSM). (Which is where I met him, when I sat in on some guest presentations at the MSM Center for Music Entrepreneurship). He also improvises and plays in a rock band. We ended up sitting next to each other when a large group went out for burgers and beer after a presentation by David Cutler, the Savvy Musician himself. When John told me about his improvising and rock lives, I thought he might be great to invite to play in Greencastle. I love his musical diversity, and his youth and rock-music interest might appeal to a younger-than-usual audience. To me, the question for classical-music presenters and performers is how to we attract younger audiences and maintain artistic integrity? One part of the answer is presenting young performers (with whom young audiences can identify) who play classical and original and/or non-classical music. So while I was in NY, John, at my invitation, dropped a CD off at my building (ah, how nice it was to have a doorman!) and sent me an email proposing a program with improvisations, classical music (Brahms, Liszt, and Hadjidakis, the latter arrangements of Greek folk tunes) and some rock music–improvisations on Michael Jackson tunes. Sounded great, and since he’s young and didn’t need a big fee (yet), we could afford to fly him in. We’re having a “Meet John Kamfonas” pizza party tonight for college and high-school students in town. That’s proved to be a bit challenging. There are relatively few DePauw students on campus for the summer, since we don’t have summer classes. I don’t have the contact information for that many of them, and have had to recruit my kids and their friends to pass on Facebook invitations. I also had to ask friends to host the party at their house, since I don’t have a piano. They are big supporters of the festival, so they were happy to do it, but I hate asking for help with stuff (something I’m working on). Since I just got back to Greencastle a week ago, and was shy about asking someone else to host a party, word may have gotten out too late for a big turnout. We’ll see. I also asked John to make a YouTube video or two we could use to introduce him–he made four! I don’t know how much of a difference they’ll make in a small town, but I do know that a number of people appreciate videos on concert venue websites as they decide whether a concert is interesting to them. This is something Greg Sandow talked a lot about in his Juilliard class: both using videos and having performers talk about themselves and what their personal connection to the music. They’ll be in my next post. Meanwhile, in addition to Facebook invites and email invitations, there’s been an article in the local paper and it got picked up by the DePauw site. My guess is the the DePauw PR director decided to do a story on it because presenting a program combining classical music, improvisations, and Michael Jackson relates to my sabbatical research. I’ll let you know how the party and concert go!